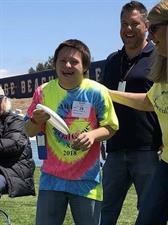 Special Games, 5/17/19, at West Valley College, sees almost 1000 extremely challenged/special needs students from the Bay Area compete in a variety of sports and events. This program started over 40 years ago and is put on annually by all of the Kiwanis Clubs in the South Bay and Peninsula. It is a no-miss, spectacular event!! For more info and/or to volunteer, email kiwanislosgatos@gmail.com.